Does a late fall meal get any better — or any simpler?! I can't describe what tomatoes and cottage cheese do for my taste buds… but let's just say it's perfection. 😉 And the nutrition? Pretty great! Raw cottage cheese provides vitamins, minerals, enzymes, and beneficial organisms (aka probiotics). As I'm sure you can agree, I may love this cottage cheese, but the final test was whether or not my family would too. And guess what? They gobble it up! Looking for more raw cheese info and recipes? Check out our Raw Cheese series, including easy raw cheese recipes, basic cultures, tools, and equipment, recommended resources, and benefits of raw cheese! Make sure your equipment is very clean. In other words, washed in very hot water or run through the dishwasher using a hot water wash/rinse cycle. Recipe adapted from Home Cheese Making. 1 gallon of milk = 1 pound of cheese. Put milk in the pot and slowly warm it to 72 degrees Fahrenheit, stirring occasionally. Keep it covered to preserve heat. If the milk is cold, it can take several hours. If the milk is fresh from milk, it may already be up to temperature. Then sprinkle the mesophilic culture on top of the milk. Stir in very well. Put the rennet in a little cup with the 1/4 cup of water. Stir well, then add to the pot of milk. Stir very well. Cover the pot and let the milk culture, or “ripen,” for 12 to 18 hours. If the room temperature is right around 72 degrees, you will not have to keep the burner on. Wrap with a towel off the burner to keep the heat in, if desired. It will coagulate into very soft curds. Then cut the curd into 1/2-inch cubes. Be very gentle with the curds — let them sit for 15 minutes, undisturbed, after cutting. Keep the cover on the pot to keep them warm. Then turn on the burner and heat the curds to 90 degrees Fahrenheit over the course of 30 minutes or so. During this time, stir gently once or twice to keep the curds from sticking and make them smaller. Now increase the temperature a bit more quickly over the next 15 minutes, to 102 degrees Fahrenheit. Hold the curds at this temperature for about 30 minutes, until they are more firm. Give them additional time if they're still soft. Pour off the whey (it is raw) and save for use in lacto-ferments! Line a colander with cheesecloth and put it in a bowl or pot that fits it. Pour the curds into it. Drain for 5 minutes. Put curds in another bowl and gently break up any large pieces. Add salt to taste. Finally, store in an airtight container in the refrigerator. Keeps for about 2 weeks. I usually keep 1/4 of this amount in the fridge and then store the rest in the freezer, in 1/4 batch portions. Do you have a favorite cottage cheese recipe? How do you love to eat cottage cheese? Have you ever had goat's milk cottage cheese? This post was featured in 15 Easy Raw Cheese Recipes. I just went to amazon and could not find a Kindle version of Home Cheese Making……there is a button to click to say “tell the publisher you want this on Kindle” am I looking in the wrong place? I would love to have this for Kindle. That’s because Amazon likes to push out the little guys. True story. Meg, you can use buttermilk as the culture here, too. I think the meso makes the cheese nice and mild. Let me know what you think of it! You’re right. Apparently, it is unavailable now. It was definitely available about a month ago when I purchased it. We should keep checking, as perhaps it is a temporary thing. I’m sorry for leading you astray, SueEllen! Oh don’t worry about it Wardee….not your fault. Yes I will keep checking. I have noticed this “not available in the us” on a couple of other things. I find it odd. Oh. My. Bookmarked for sure. I adore tomatoes with most kinds of cheese. They’re perfect for each other. And crepes? Adore. Those tomatoes look so rich in color, I’m sure they tasted wonderful. 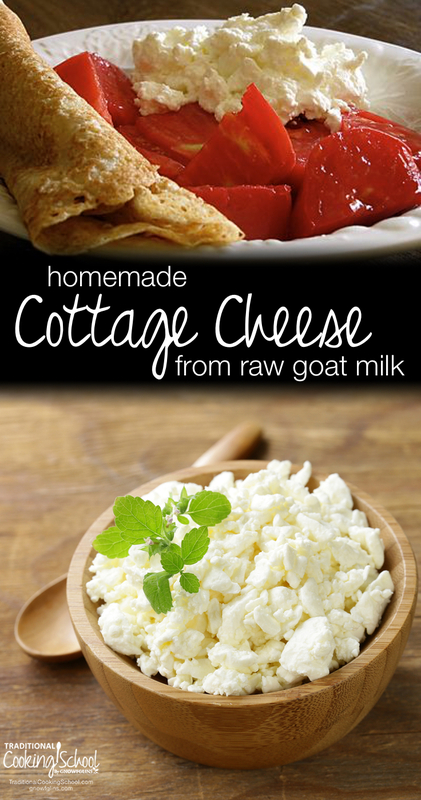 I have never made cottage cheese, though a friend sells goats milk and with this recipe there is no reason not to try it. My husband loves cottage cheese with fresh fruit, but I haven’t found any at the grocery store that aren’t made with skim milk and other undesirables. I’ll have to try this one! Yummy, I love cottage cheese with fresh tomatoes! Think I just might need to try this out! i love the idea of making cheese but haven’t done any except for (appetizingly named) “bag cheese”. It just used vinegar or lemon juice to separate the curds and then you drained it over the sink in the afore mentioned bag. And nobody liked the taste except me…I’ll have to try these excellent non-scary instructions for a tasty cottage cheese! Um. I’m just starting to make yogurt cheese. My first batch was tasty and fun. I’m trying it again with a little more salt and more herbs. Thanks for another great recipe Wardee! I made some homemade farmer’s cheese last weekend and am excited to try this cottage cheese. Crepes sound really good right about now. 🙂 I featured this in my Weekly Recipe Wrap Up b/c I don’t think people realize how easy it is to make cheese at home! Once you master the basic recipes, you can move onto more difficult recipes! How fun!!! My now 5 year old son made a comment a few months back while my mom was eating cottage cheese that he likes it. News to me since I’ve never purchased or fed it to him! Can you tell I don’t like it? At that point I decided I’d figure out how to make it, but never followed through. This sounds easy enough, but can you tell me this…am I likely to enjoy this since it’s homemade vs store bought? I don’t know what I don’t like about any that I’ve tried, just…ew. I like the chevre I make and seems like it’d be similar. Kelly — I think you might like this. If you like chevre, you’ll probably find the flavor similar. At least I hope so! Hello, I’d love to try and make this. So, do understand correctly that you can half the recipe and just use 1 gallon of milk? Also, I assume you can use cow’s milk, right? If I am using raw cow’s milk, is it best to skim off the cream first? Thanks so much. Lanise — Yes, you can halve the recipe. You’ll only need 1/8 teaspoon of the mesophilic culture. Interestingly, you can use 1/4 teaspoon up to 3 or 4 gallons of milk. The meso culture doesn’t scale by doubling or tripling. But it is flexible and hard to get wrong. For the best cottage cheese, I’d leave the cream in. 🙂 It will be delicious with cow’s milk, too. Let me know how it goes! I just came across this website! Very excellent! I eat mostly a Raw food, vegan diet, with some Raw Goat or Sheep dairy because every person’s body requires a different kind of diet :). I cannot have gluten, cow dairy, or sugar cane of any kind, I don’t eat meat, but I’m not against it. I was wondering if you do or you could sell the Goat Cottage Cheese that you make? I would like to buy Goat Cottage Cheese from you! 🙂 Please let me know what you think? thank you so much! Keep up the good work! since its made from goat’s milk, does that mean it’s dairy free? No, goat milk is still considered dairy. Any milk from a lactating animal (goat, sheep, llama, cow, etc.) is dairy. Goat milk can be easier to digest for some. If you’re looking for dairy free, you’d want to look at homemade almond milk (store-bought dairy substitutes are not good) or coconut milk. I have rennet in tablets.How much would you use for this recipe? It says that 1 tablet equals 1 teaspoon liquid rennet. Also should I get liquid rennet in the future? I’m new to the whole cheese making process, but we have lots of goat milk, so I’m trying it out. Thanks for your help. Hannah, it is hard to get a tablet to work in this recipe. However, it can be done… carefully. To get 4 drops out of your tablet, dissolve it in 30 tablespoons of water, and then measure out 4 tablespoons. The rest will not last long and should be discarded. I just tried this cheese, I followed the instructions closely. Left it to set for around 18 hours and I had a great curd. After cutting and “cooking” the curd according to the instructions, I cannot seem to get it to shrink down and firm up the curd. They are instead threatening to dissolve? Not sure what I might have done wrong? I’m having the same problem! Please help! Sounds like it got yeasty – is there sourdough starter or other ferments nearby? I just made this. I think it will turn out, but I had trouble holding it at 102 degrees. How is this done? There is probably some technique I am missing. Thanks! You can change the update to say the book is available at Amazon for Kindle and in paperback in the US. I just bought a copy, yay! I don’t know where else to ask this, I am making regular cow’s milk cottage cheese following the steps in your e-course booklet. 1) getting the temperature right: I am still working on it, but I guess I have to take the pot our of the water bath when I hit the right temperature. 3) if nothing happens after 1 hour at 102F, what can I do? It occured to me that I could heat it up and put a bit of apple cider vinagre to get ricotta, but I am not sure what to do. Instead of the mesophilic culture can i use Kefir? Thank you. Does this still contain lactose ?? 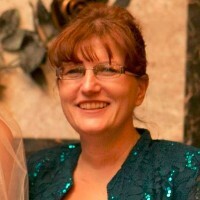 Michelle, much of the lactose is reduced through culturing. I can’t say that it’s all gone, though it is significantly reduced. I followed your recipe and the cottage cheese looks great it just don’t taste like it. It taste a little to sour. Did I do anything wrong. I used raw goat milk. And I did make other cheese before and they turned out great. I would try using fresh milk (if your milk wasn’t fresh at the time you made this) or you could try dripping it in the fridge instead of at room temperature. It gets sourer during that time.